Warm air surging into New England Wednesday challenges record high temperatures for many cities as afternoon temperatures rise to around 70 degrees! Cooler exceptions will be near south-facing coasts, thanks to a southwest wind blowing across the water, and in far Northern Maine where the day dawned with snow and highs won't exceed the 40s. Boston, Worcester, and Pittsfield, Massachusetts, Providence, Rhode Island, Hartford, Connecticut, Bennington, Vermont, Portland, Maine, and Concord, New Hampshire have already set temperature records. 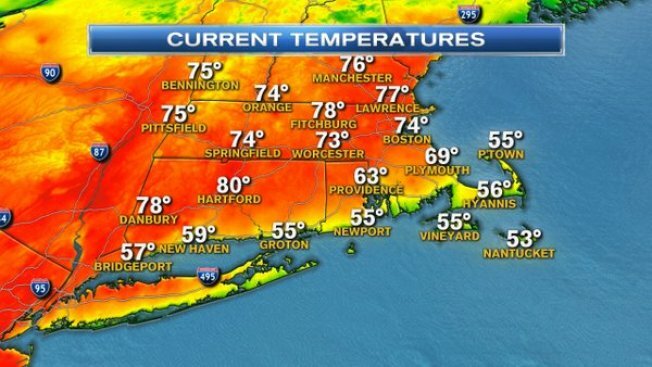 Boston hit 74 degrees as of 2 p.m., breaking the old record of 72. 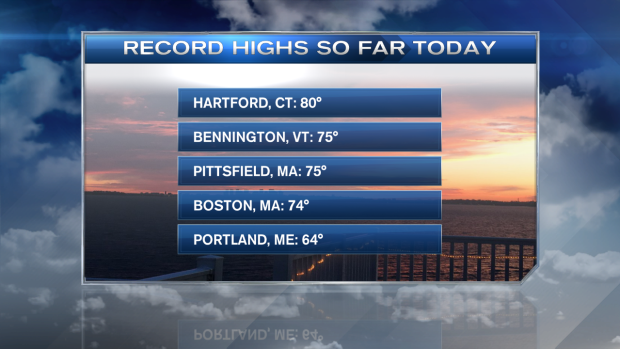 Worcester also broke a record at 73. The old record was 72. This evening, an approaching cold front from Canada will focus some scattered showers along the Canadian border, and those will continue into the overnight, while most of New England sees a mild overnight with increasing clouds. Though the cold front moves southward across New England Thursday, it will move slowly enough for highs to reach the 60s for most, and to focus raindrops that begin as morning showers, then ramp up to afternoon and evening rain that will persist through the overnight. Friday may start with an early morning shower, but any lingering raindrops would depart early for high pressure - fair weather - to build across the region, locking in fair weather for Friday into the weekend. Even a passing cold front Saturday late-day will come with little fanfare, though it may lower the temperatures a bit heading into Sunday. Next week starts with showers on Monday, but right now looks to be another mild and fairly quiet week, thereafter, in our exclusive, Early Warning Weather 10-day.